The MP 3000 is used for air, water and oil applications, designed as a portable Multi Purpose Ozone Generator MP-3000 (3000mg/hour Ozone output)﻿. This unit is versatile, efficient, reliable and heavy duty from household applications to light industrial and commercial applications. 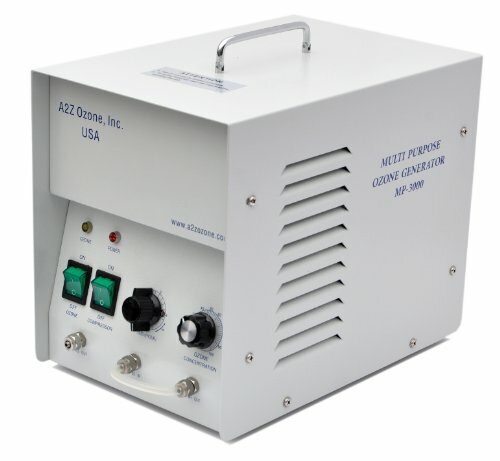 The MP 3000 is equipped to take ambient air or oxygen from a tank or an oxygen generator. It comes with a built in air compressor for optimum ozone output. The unit is equipped with a heavy duty cooling fan to keep the unit at the optimal temperature for maximum life expectancy. It has a timer to shutoff automatically or it can run continuously. It's ideal for everyday large volume water ozonation for drinking, bath, sanitation or light industrial water treatment applications including large aquariums, fish farms, large hot tubs, spas, swimming pools, water towers, industrial ice makers, dish washers, laundry applications and more. It shock treats any room to remove all smells and odors, viruses, and mold. With an easy to set timer, it's just one push of the button and you can walk away. It can also be used for ozonation of natural oils such as olive oil into solid. If you have any questions about this product by A2Z Ozone, contact us by completing and submitting the form below. If you are looking for a specif part number, please include it with your message.